136 Marlborough is located on the south side of Marlborough, between Clarendon and Dartmouth, with 134 Marlborough to the east and 138 Marlborough to the west. 136 Marlborough was built in 1871-1872 by John Fisher Farrington, a carpenter and builder, for speculative sale, one of three contiguous houses (132-134-136 Marlborough). 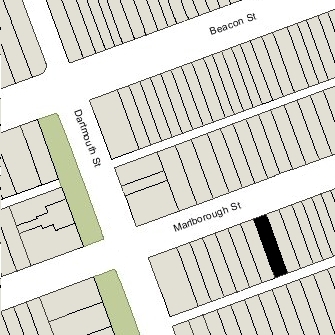 He also built five more contiguous houses in 1872-1873 at 140-142-144-146-148 Marlborough. 138 Marlborough was a vacant lot until 1891. John Farrington purchased the land for 136 Marlborough on December 4, 1871, from the Commonwealth of Massachusetts. Click here for an index to the deeds for 136 Marlborough. On October 1, 1872, 136 Marlborough was purchased from John Farrington by Mary (Crehore) Moseley, the wife of retail boot and shoe dealer Thomas Edward Moseley. They previously had lived at 116 West Concord. The Moseleys’ sons, Edward Crehore Moseley and Frank Moseley, lived with them. Edward Moseley married in October of 1872 to Ellen Wheeler. After their marriage, they lived at 136 Marlborough with his parents. He was superintendent of the Continental Sugar Refinery. In 1887 and 1888, he listed himself in the City Directories as a physician, but by 1889 he had joined the firm of Horatio Harris & Company, auctioneers and commission merchants (Horatio Harris was married to Edward Moseley’s maternal aunt, Eunice Elizabeth Crehore). Frank Moseley married in April of 1880 to Martha Alger Hawes. 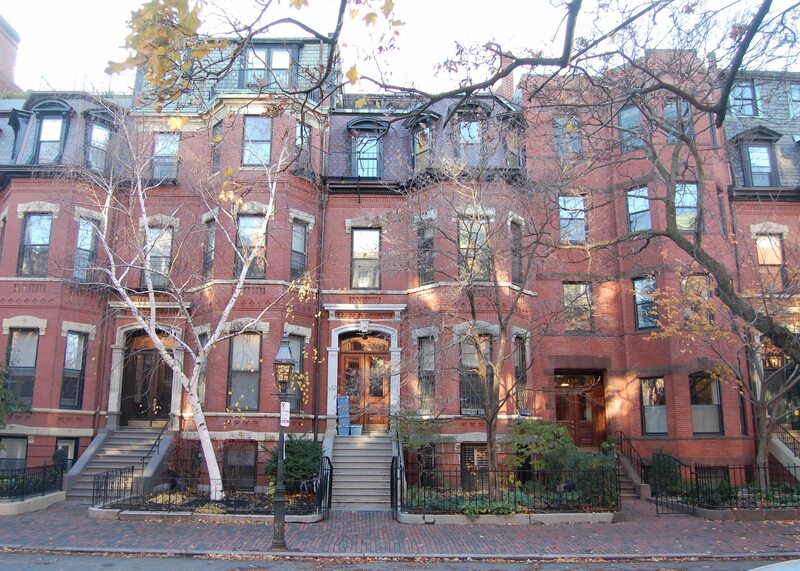 After their marriage, they lived at 136 Newbury. He also was associated with the firm of Horatio Harris & Company. Thomas Moseley died in May of 1890, and on June 27, 1890, Mary Moseley transferred 136 Marlborough to Edward and Frank Moseley as trustees on her behalf. Mary Moseley and Edward and Ellen Moseley continued to live at 136 Marlborough. Ellen Moseley died in April of 1892. Mary Moseley and Edward Moseley moved soon thereafter (Edward Moseley was living at The Charlesgate at 535 Beacon in 1893). 136 Marlborough was not listed in the 1893-1895 Blue Books. In November of 1894, 136 Marlborough was acquired from Mary Moseley’s heirs by Harriet (Barber) Willard Houghton, the wife of Dr. Henry Arwin Houghton. He was a physician and also maintained his office at 136 Marlborough. They previously had lived (and he had maintained his offices) at 12 Cordis. Henry Houghton died in January of 1899. Harriet Houghton continued to live at 136 Marlborough until her death in March of 1917. Helen Willard, her daughter by her first marriage (to Jacob P. Willard), and Henry (Harry) Houghton, Dr. Houghton’s son by his first marriage (to Sarah D. Page), lived with her. On May 29,1917, 136 Marlborough was purchased from Harriet Houghton’s estate by Ellen (Upton) Philler, the widow of George Philler, She previously had lived in Philadelphia, where her husband, who had been president of the First National Bank in Philadelphia, died in November of 1916. She continued to live at 134 Marlborough until her death in January of 1930. On January 29, 1931, 136 Marlborough was purchased from Ellen Philler’s estate by Edward Bancroft Bayley. He and his wife, Mary Richards (Clark) Bayley, lived at 134 Marlborough. 136 Marlborough was not listed in the 1931-1936 Blue Books, nor in the 1930-1936 Lists of Residents, and was shown as vacant in the 1930-1936 City Directories. On August 22, 1935, 136 Marlborough was acquired from Edward Bayley by Alice E. (Kimball) Murdock, the widow of Harry Parke Murdock. She lived at 177 Newbury. Prior to selling the house, Edward Bayley entered into an agreement with his wife, owner of 134 Marlborough, establishing an easement right to “light, view, air, and prospect” over the existing buildings at 136 Marlborough, to remain in effect until the Bayleys died or sold 134 Marlborough, or until September 1, 1955, whichever occurred first. On June 16, 1936, 136 Marlborough was purchased from Alice Murdock by May Washburn (Pearson) Spofford, the wife of Charles Milton Spofford. The sale was reported by the Boston Globe on June 21, 1936, which indicated that the Spoffords planned “to renovate and occupy the property this Fall.” They previously had lived in Brookline. Charles Spofford was a consulting engineer; he had been head of the MIT Department of Civil Engineering from 1911 to 1935. May Spofford died in February of 1957 and Charles Spofford moved soon thereafter. On July 9, 1957, 136 Marlborough was purchased from May Spofford’s estate by Mrs. Elizabeth (Gunther) Ford Edson, the former wife of Edward Layton Ford and the widow of Robert Adams Edson. In July of 1957, she applied for (and subsequently received) permission to convert the property from a single-family dwelling into a three-family dwelling and lodging house. She also operated lodging houses at 338 Commonwealth and at 114 Commonwealth, where she lived. By 1970, 136 Marlborough was the home of Alice McLaughlin, who continued to operate it as a lodging house. On June 12, 1978, 136 Marlborough was purchased from Frances G. Colby, conservator of the estate of Elizabeth G. Edson, by real estate broker and investor George P. Demeter, trustee of Demeter Realty Trust. In September of 1978, he applied for (and subsequently received) permission to convert the property from a three-family dwelling and lodging house into four apartments. 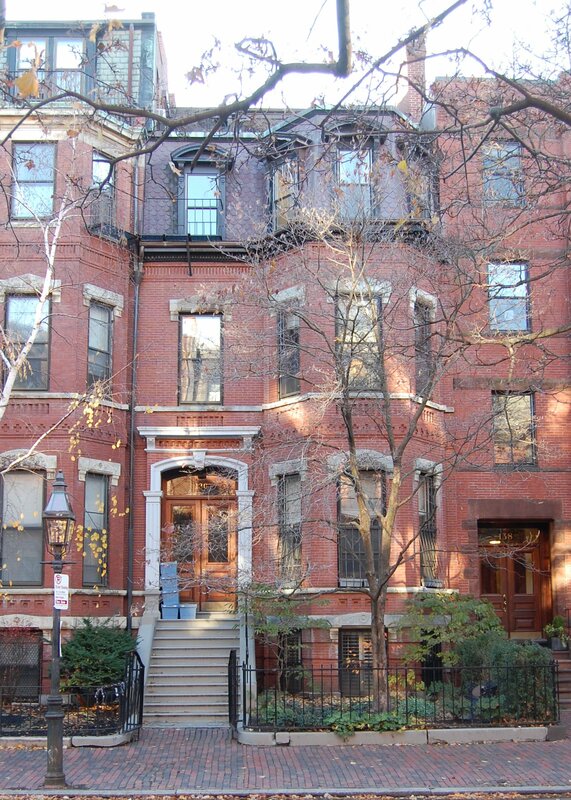 On April 27, 1979, he converted the property into four condominium units, the 136 Marlborough Street Condominium..
On December 21, 2004, the 136 Marlborough Street Condominium Trust entered into a “Preservation Restriction Agreement” with the National Architectural Trust for the purpose of ensuring preservation of 136 Marlborough’s exterior.